Eastern red columbine, Aqueligia canadensis in a garden. Our native species of columbine, Aquilegia canadensis – commonly called eastern red columbine, wild red columbine, or Canadian columbine – is at its peak in spring when its dangling blooms offer ornamental interest and food for ruby throated hummingbirds. 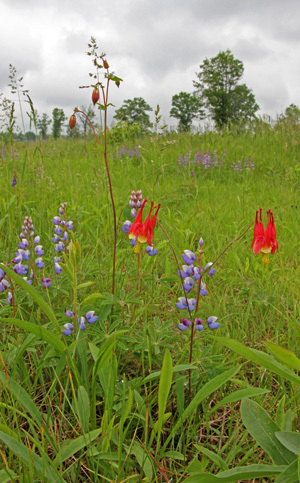 Eastern red columbine and lupines in prairie at Necedah National Wildlife Refuge. This wildflower in the buttercup family (Ranunculaceae) occurs naturally in open woodlands, clearings, and rocky slopes from Nova Scotia to Saskatchewan and in most states east of the Rockies (zones 2-9). It is an attractive, old-fashioned garden plant that has received the Royal Horticultural Society’s Award of Garden Merit. This erect, sparingly branched herbaceous perennial grows foliage each year from a caudex (a vertical underground stem) and may form woody rhizomes. 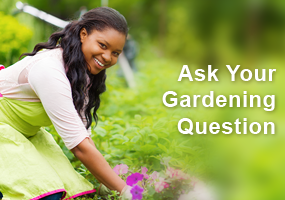 Height is quite variable, from 6 inches to 4 feet tall, depending on soil, light, moisture, and other conditions. 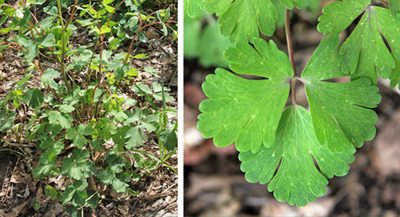 Basal foliage (L) and leaf (R). The glaucous, light green to blue-green, three-lobed leaves grow both from the base and along the flower stems. The basal leaves are produced first, forming a mound of foliage. Each compound leaf’s three leaflets are divided into three rounded lobes, which may be further subdivided in threes to look like large rounded teeth. The foliage is quite attractive even when the plants are not in bloom and will turn yellow in fall (if moist enough; the foliage will senesce in mid to late autumn, dying back to the caudex, if dry). Under the right conditions it can develop red and orange coloration. 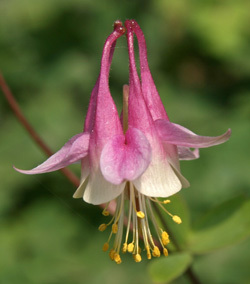 The exact time frame for flowering is determined by weather, but typically columbines are in bloom for about a month in May and June in Wisconsin. The showy, 1-2 inch long flowers have 5 yellow petals each with a long, upward pointing, red, nectar-bearing spur, 5 spreading red sepals, and many yellow stamens dangling below. The Latin translation of the genus name Aquilegia references the shape of those spurs that supposedly resemble the claws of an eagle. Flowers are a critical food source for returning ruby-throated hummingbirds in spring, and are also visited by bumblebees and hawk moths for the nectar and other bees for the pollen. The nodding flowers are held on sturdy stems above the foliage, forming a cloud of blossoms on larger plants. Eastern red columbine blooming (L), in bud (LC), flower (RC) and closeup (R). Flowers are followed by 5 pod-shaped follicles with long beaks that contain numerous small, shiny black seeds. Plants self-seed readily. Eastern red columbine seeds (L), seedlings (C) and young plant (R). Eastern red columbine along a shady path. 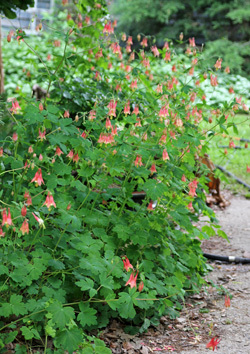 Grow eastern red columbine in light to moderate shade or in full sun as long as it has adequate moisture. Although it does best in rich, moist soils, it tolerates a wide range of soils as long as they are well-drained. 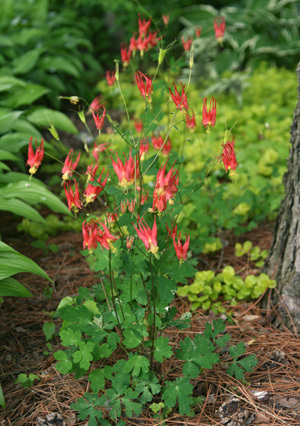 This columbine will naturalize under the right growing conditions and is perfectly suited to woodland or native plant gardens. It can also be a good addition to borders or cottage gardens. It combines well with spring bulbs, hostas, and astilbe in shade gardens, and with other native woodland plants, such as trilliums, wild geranium, and wild ginger, in more naturalized settings. 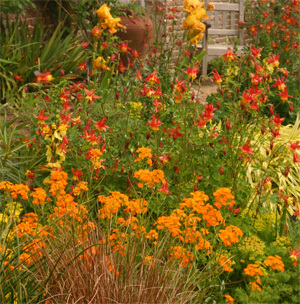 Eastern red columbine with orange wallflower and yellow iris at Sissinghurst, England. foliage will look better with regular moisture. Spent flower stalks can be cut off to make the plants look tidier. 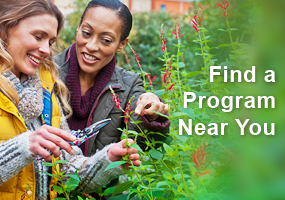 If the plants are looking really ragged, they can be cut back to the ground in late summer, but the foliage can be left for fall interest if it is still in good shape. Eastern red columbine has few pests, but it is a host plant for the columbine duskywing (Erynnis lucilius), a caterpillar that eats the leaves, as well as a few other native insects. Leafminer is less common on this species than on other columbine species and hybrids. 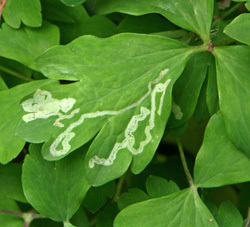 It is sometimes attacked by leaf miners that leave serpentine trails in the leaves, but is much less susceptible than other columbine species and hybrids; typically leaf miners only cause minor cosmetic damage and almost never impact the health of the plant, whereas they can cause significant damage on other columbines. A. canadensis is generally not bothered by deer or rabbits. This species is readily propagated from seed, blooming in its second year. If planted indoors, seeds need cold moist stratification for a few weeks. Or sow outdoors in fall for natural stratification. Seeds germinate in 3-4 weeks. Large plants can be divided in spring. 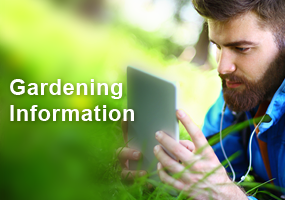 Established plants can be moved, but seedlings do not transplant well. Eastern red columbine is frequently a short-lived plant, but often will self seed to increase or maintain a population. It readily hybridizes with other Aquilegia species. ‘Corbett’ is a dwarf form with sulfur yellow flowers. ‘Little Lanterns’ is very short, growing about 10 inches tall with blue-green foliage and flowers like the species. ‘Nana’ has all yellow flowers. ‘Pink Lanterns’ has pink and white flowers. I was so delighted to discover what I thought to be wild columbine while camping/hiking in northern wisconsin for a week. Sure enough,I compared my photos to yours and realized I had indeed found them blooming along a sunny path. Thank you for your article to help me enjoy my walks so much more than I already do! I have a tiny bit of paradise near Green Bay and will try my hand at growing some on my 13 acres. Next I will search the nearby plant stores to see what I can find. THANK YOU for your article!